Tandem Skydiving is a fabulous way to experience the action packed adventure of freefall and parachuting for the first time. Attached to your instructor via a dual harness, you will enjoy the thrill of skydiving in a comfortable situation, the wind speeding past your face as you wave to your freefall photographer or tandem instructor's handcam video camera. On arrival to our purpose built Drop Zone at Langhorne Creek, and after completion of the paper work (which includes your APF membership), the tandem skydive involves about 15 minutes training and away you go! Your instructor wears a parachute built especially for two and you wear a harness. We use the most advanced and up-to-date equipment with all parachutes fitted with computerised back-up opening devices. The aircraft ride takes around 20-30 minutes to reach your exit height, at which point you will depart the aircraft, experience the thrill of freefall for approximately 25 – 60 seconds, reaching speeds up to 220kms per hour. Your instructor will open the parachute at 5,000ft and you will have a 5-7 minute canopy ride back to the Drop Zone, experiencing the spectacular views of the great Murray River, Adelaide Hills, Coorong, Lake Alexandrina and the South Coast. The jump finishes with you lifting your legs so your instructor can perform the landing for you, just metres away from your family and friends. 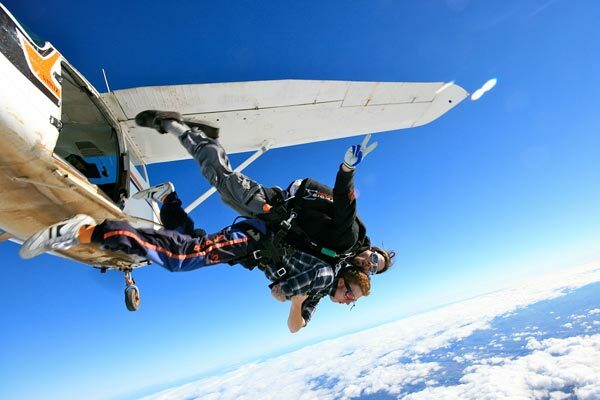 Skydiving is an exhilarating feeling which is almost impossible to explain. If you have requested a photography package of your skydive, after the skydive watch the footage in our fully air-conditioned/heated club rooms on the big screen with your friends and family.